The IDOL 4S works like a PC without the PC price. Windows 10 offers a ubiquitous experience on the IDOL 4S allowing you to sync your Office documents across devices to get work done while you're on the go. The IDOL 4S makes business limitations a thing of the past. Connect your IDOL 4S to a Microsoft Continuum-compatible accessory and use it with an external monitor, a keyboard and a mouse. A screen so unreal you need to see it to believe it. The beautiful 5.5" Full HD AMOLED display brings your pictures, movies, apps and games to life in a whole new world of color - with a bright display even in direct sunlight. 5.5" Full-HD (1920x1080) AMOLED DragontrailTM . GSM 4G LTE Device is manufactured Unlocked and covered by Manufacturer Warranty. Functions in the US with service from AT&T, Cricket, T-Mobile, and Metro PCS. Will work internationally with most GSM providers but you will want to check with each provider to verify. GSM 850/900/1800/1900, UMTS 2/4/5, LTE 2/4/12 Wifi Specs 802.11a/b/g/n/ac(2.4GHz & 5GHz). VR in the Box: Unleash the unbelievable. 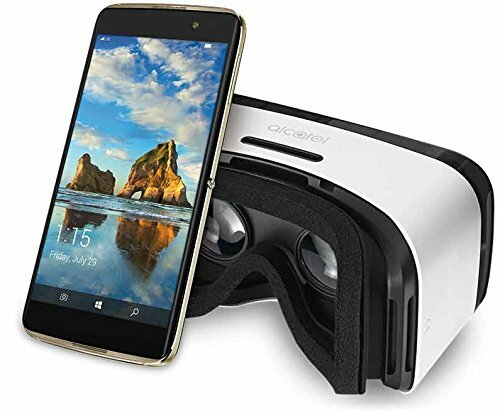 The world's first Windows 10 smartphone + VR goggle package delivers virtual reality that everyone can enjoy right out of the box. Immerse yourself in 360 degree experiences. Get behind the wheel of a Formula 1 car right from your living room, explore far off lands on your lunch break or go deep sea diving while on the subway. Bask in an elevated sound experience with all-around-audio with multi-directional 2 front and 2 rear Hi-Fi speakers.